Thanks to the internet, the Kindle, the iPad and print on demand technology, self publishing is rapidly becoming the acceptable way for people to share their thoughts and ideas. However, the Australian publishing industry has been slow to create pathways for Australians to access the best ebook and print on demand options so readily available to our Northern Hemisphere counterparts. IPEd Accredited Editor and owner of IndieMosh, Jennifer Mosher, has been helping Australian writers tread the self publishing path, to have their say and leave their mark on the world, since 2009. 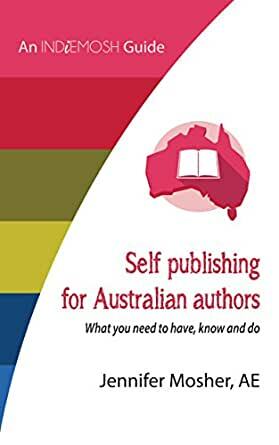 In 'Self publishing for Australian authors: What you need to have, know and do', Jennifer shares her learnings (and many of her opinions! ), summarising the steps to take and questions you need to ask yourself if you wish to venture down the self publishing path. Rather than a ‘how to’ guide, this book is more of a ‘what’s it all about guide’, and has been designed to provide you with the right information so that you can work out which path (if any) is right for you. great information, tells it how it is with no nonsense. It has lots of practical information in it, explains what IndieMosh does as a self-publishing facilitator (SPF) and explains their costings, as well as what is required if you want to do it yourself. The book has lots of tips like what to do regarding the use of song lyrics or brand names in your story, to tax information. It lays out the difficulties faced by an author self-publishing when they live outside the US. I would recommend this book to Australian authors considering self-publishing, whether they are looking at doing it themselves or using a SPF. Good solid advice, especially in the marketing section. Breaks down the process into easy bit chunks. Answered all my questions, very helpful.